Somewhat related to the most recent US elections, I've been researching the whole "white working class" situation, and one strange anomaly has popped up. When one looks at a graph of productivity (for the US) vs real wages, there is a marked "disturbance in the force" around 1974. Is there any agreement among economists as to what caused wage growth to plateau like this? I studied the article that luchonacho suggested, by Bivens & Mishel (2015), and found it interesting, but it didn't directly address my question. 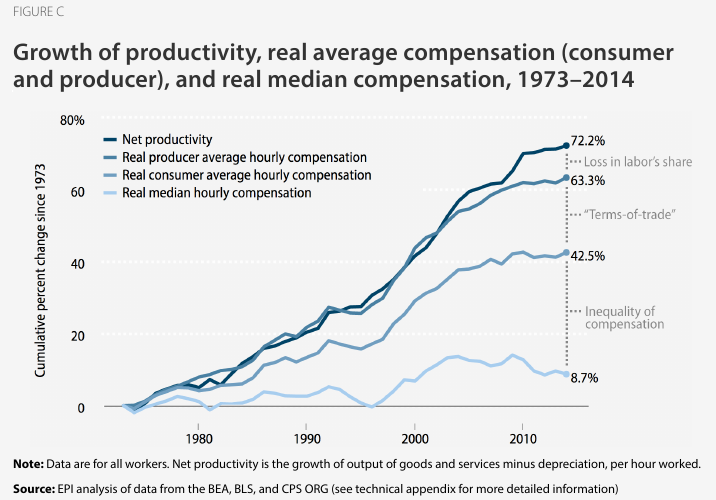 The article was basically a justification for the numbers presented in the above graph and similar presentations, in particular arguing against skeptics that the productivity numbers were real -- that productivity hadn't leveled off with wages. I'm not able to evaluate these arguments to any significant degree, but at least on the face of it their justification seems sound. This was during a period of fairly serious "stagflation"
Which of these factors (or several other ones too "minor" to mention here) is relevant to my question is hard to guess at this point. The issue is confused by the fact that, though the "knee" in the curve appears to be 1973, that was a period of significant economic turmoil (probably the worst since WWII and before the Bush-era difficulties), so it's not unexpected that the lines would "jiggle" a bit, and thus it's hard to place a date on the actual change of the nature of the economy that caused this phenomenon. I will continue investigating, and I would appreciate any (constructive ;) ) input. Finished a first review of the Bivens (2014) article, and it didn't have anything real solid to offer. Several contributing factors were mentioned, but most didn't kick in until the 80s, or later, and the general drift of the article was to propose "fixes" to current conditions rather than explain the triggers that caused the phenomenon in the first place. The one factor that might have applied early is private sector union membership, as it took a nose-dive in the early 70s. (This was made up, in part, by a rise in public sector membership.) And some argument can be made that tax policies had some part in things, though the evidence for this is weak. However, while reviewing the article I went off on a few tangents, exploring statistics that the article did not directly address. I (a bit to my surprise) found some seeming correlations between the "real wage" fall off and the growth of money supply, the negative balance of payments, and the rise in national debt, all of which changed course in the early 70s, resulting in permanent deviations from historical patterns. One thing I haven't found, but which I suspect, is that some changes in the rules for corporate governance may have been a factor. In 1971 President Nixon supposedly said "I am now a Keynesian in economics", after Milton Friedman had previously stated "We are all Keynesians now". The main issue at play here was the idea of intentionally running a federal budget deficit to "spur" the economy. The result is that the federal budget has been (with the exception of 1998-2001) running (ever increasing) deficits. And, close as my Ouija board can decipher, this has the effect of drawing in a lot of foreign investment which, oddly, upsets the balance of trade in the wrong direction (the balance of trade has been negative since about 1975). This imbalance is commonly blamed on "free trade policy", but basic economics argues against this -- especially with "free trade" the value of the dollar should self-adjust to the point where exports and imports balance. Of note is the fact that about 31% of the federal debt is held by offshore entities, and (using slightly stale numbers, and assuming that the ratio is relatively steady over time) that amounts to about \$370B of the annual deficit, as compared to the roughly \$500B trade imbalance. 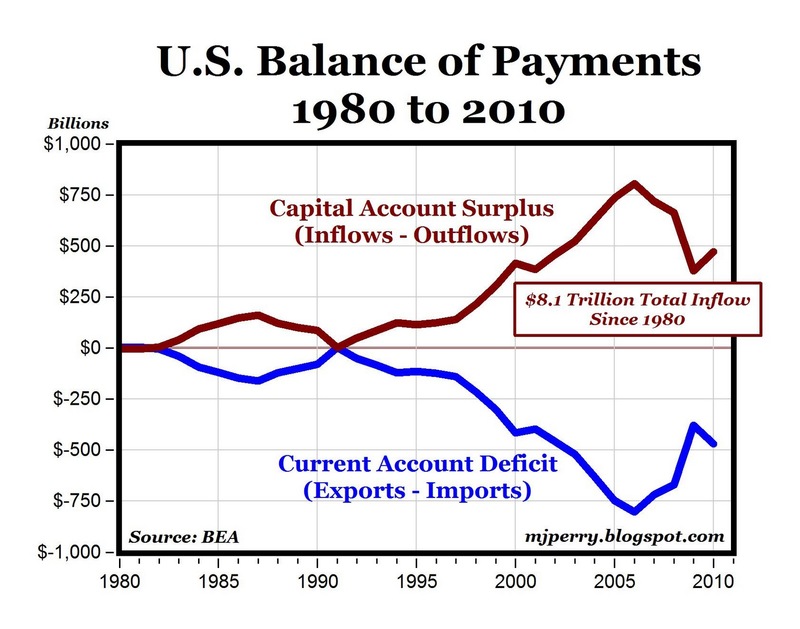 So one can argue that deficit spending accounts for the lion's share of the trade imbalance. So my conclusion is that a "Keynesian" tax policy (accompanied by an ever-stronger tendency to under-tax the rich) is what is mostly responsible for the plateauing of real wages, and restoring pre-1981 upper bracket tax rates would likely alleviate much of the problem. Anyway, Clifford claims that, ca 1980, corporate boards were in effect sold a new bill of goods by Michael Jensen and Milton Rock. These guys put forward a philosophy of corporate management which emphasized giving CEOs "incentives" of various types, vs a simple salary and straight-forward stock options. They also promoted the idea of comparing CEOs to their peers, in terms of pay, and targeting some Nth percentile of their peer group pay. These proposals seemed innocent enough, and many corporate boards picked them up (also accounting firms and various consultant groups, as they saw that they could profit from assisting in their implementation). In theory "pay for performance" seemed good, but it quickly got out of hand. Obviously, when calculating CEO base pay for your company, you don't target the 50th percentile of "peers" but go for 60, 75, even 90, because clearly you expect your CEO to be exceptional. And various stock bonus schemes strongly encouraged CEOs to play games to manipulate stock prices. Plus, as it turned out, boards were really lousy at withholding bonuses when they weren't really earned. Then, in 1993, Clinton and the Democratic Congress pushed through a tax increase bill that had one tiny loophole -- stock options for CEOs would be exempted from corporate taxes. This resulted in an explosion of stock option awards, and overall CEO pay jumped from 100x the average worker to 300x almost overnight. This seems to fairly completely account for the effects seen, in terms of escalating CEO pay and a portion of the lost "working class" jobs/wages. Unfortunately, the way out of this quagmire is not obvious. Clifford offers some suggestions, but getting anything through (CEO-owned) Congress will be difficult, to say the least. As is the case for many articles in that magazine, the review borders on impenetrable, but it does discuss factors surrounding my issue at considerable length. Based on the review, the book glorifies the economic system, both US and international, that existed after the Bretton Woods agreement (1944), and prior to 1973. According to Kuttner, 1973 marked "the end of the postwar social contract." To quote Crain, "Politicians began snipping away restraints on investors and financiers, and the economy returned to spasming and sputtering. Between 1973 and 1992, per-capita income growth in the developed world fell to half of what it had been between 1950 and 1973." Income inequality increased, the median real income of "working class" Americans fell. And, significantly, "faith in democracy slipped." Kuttner/Crain discuss a number of things that went on beginning around 1973 (including the fallout of the Arab oil embargo), but, from the philosophical standpoint they hang the economic turn-about on the return of laissez-faire philosophy to the political sphere. Eg, in January, 1974, the US removed the constraints on sending capital abroad, and in 1978 the Supreme Court overturned most state laws against usury. A litany of effects basically gutted Keynesianism as it had previously existed, and the US economy (and the world's) lost its balance. Terms of trade: discrepancies between NDP deflator and CPI. Recall real wages are deflated with CPI, whereas GDP price index include other stuff like price of investment, terms of trade, etc. Inequality of pay: a rough measure of the difference between mean and median pay. If wages are equally distributed, these two are equivalent. Part of the stagnating real wage anomaly could be explained by the increase in labour supply that occurred in the US labour market in 1975 due to the participation rate rising. The US participation rate jumped from around 60% in 1970 to 64% in 1980. As the labour supply increased, the price of labour decreased due to the competition created by the additional supply. As the Marginal Productivity of Labour is diminishing with quantity, additional labour supply would cause the marginal productivity of labour (MPL) to fall and thus the value of nominal wages (assuming wage is a function of price and MPL, Wage=Price*MPL) to also fall. In terms of stagnating real wages, that is, the number of goods and services a household can consume, the graph again contradicts what we would expect to see from rising productivity. That is, higher productivity should result in a reduction in the price of goods and services. 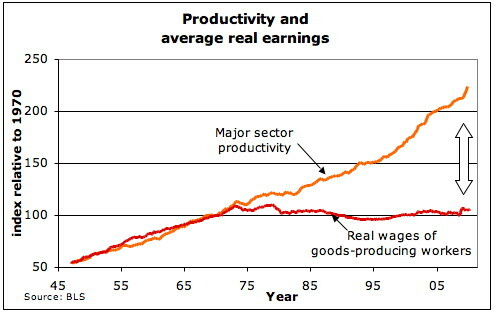 To explain this, the relative decrease in the nominal wage (as discussed above) would have to be equal to or greater than the reduction in the price of goods and services caused by increases in productivity. This solution appears ambiguous at best as it is unlikely that nominal wages would fall significantly from a 4% increase in labour supply. An analysis of labour supply in the US, during and following the 1970s can be used to explain some of the stagnation in the value of real wages but cannot be used conclusively to explain all of the lack of real wage growth. Benefit costs have been increasing. One hypothesis is that the overall compensation increases have been going to benefit increases rather than wage increases. I.e. if my employer is paying \$5000 a year more for my healthcare, it may be unwilling to give me \$5000 cash in addition. Another hypothesis is that inflation undercounts quality improvements. If my house is 50% bigger than my parents' house and costs 50% more, is that 50% inflation? Or zero? Or something else? Also consider some things that are ubiquitous now. Television in every bedroom. I grew up with just one in the house. Everyone owns their own computer. My family didn't own a single computer until I was around ten. My parents each have their own now. Mobile phones. I was the first member of my family to get one as an adult. Many families now have one for each person, including the kids. DVD (or Blu-Ray) player. My family got its first VHS player after the computer. Microwave. Another appliance that appeared in my house when I was older. Digital Video Recorder. Not ubiquitous yet, but much more common. Internet. My family got dial up years after the computer. Now everyone has broadband. Cable. Once you already have broadband, adding cable TV is cheap. Particularly if you also have a landline. Cars are much more advanced now. E.g. higher fuel economy. Prepared meals have replaced garden produce. As a kid, my family made its own tomato sauce from garden-picked produce. Now, I buy that in a jar or even get a whole frozen dinner that is already cooked and just needs heated. How is it that we have so much more stuff on less money? The house is taking a percentage right off the top. In 1979, the top 1% of the population's share of U.S. income, including capital gains, was hovering around 9-10%, with the top 0.1% having about 2.5-4.0%. In 2013, those percentages were 20% and 9.5%, respectively. In 1979, the bottom 50% in the U.S. earned 20% of all income. As of 2013, that share had dropped to 13%. All income group segments of the U.S. population (by quintiles) experienced real pre-tax and after-tax income gains from 1979-2013. The "rising tide lifted all boats," though not evenly. Capital and equity owners have been taking excessive profits because they can. Labor has been left in the dust: because employees became satisfied. Policies that made it happen: Taxation is less progressive; unions power has decreased or at least have not grown. See Martin Ford's 2015 book Rise of the Robots. It is just starting, and this trend is consistent for the last thirty years. Slowly but surely, jobs that used to afford a living for families have been disappearing in favor of machines, systems and outsourcing. That in itself is not a bad thing. BUT humans are not able to adapt quickly enough, and labor is slowly being cheapened compared to whiz-bang machines and systems. 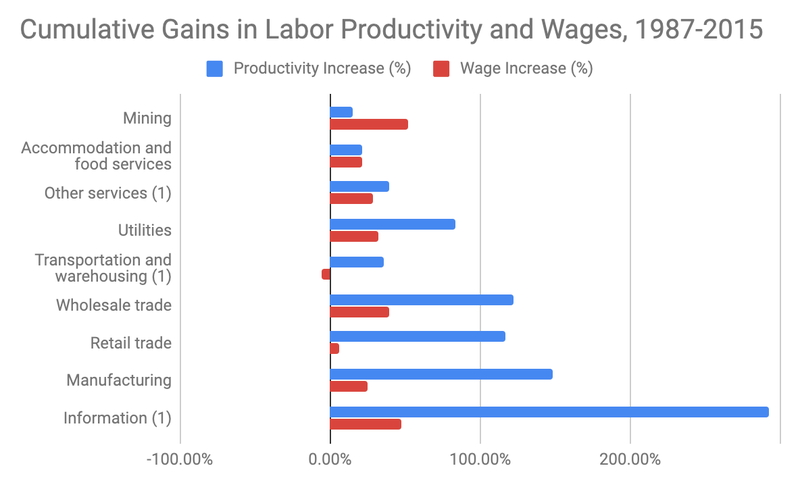 The erosion of labor unions (directly and indirectly) probably accounts for some of the failure to translate productivity into wage growth but it's important to not forget labor productivity is synonymous with labor efficiency. In the retail, wholesale, and transportation and warehousing sectors, in the past large amounts of time used to be spent checking inventories. Today this needs to happen much less often and therefore makes labor more efficient. Software automatically calculates what inventory needs to be restocked and optimizes the process by which it's done. Labor has been reduced to flesh drones that are utilized much more efficiently. In the wholesale sector, in the past workers had simple 8 hour schedules. Today, Amazon workers only work for while there are packages that need to be processed so labor is fully utilized. In manufacturing, it's just in time manufacturing processes and better automation. In the information sector, email and instant messaging increases efficiency in communication. Googling answers to common problems saves workers hundreds of millions to billion hours a year easily. There are other factors certainly but the biggest law passed 50 years ago that's contributed most to the rise of productivity without wage growth is Moore's Law. In the end, software has made us all much more efficient commodities. Not the answer you're looking for? Browse other questions tagged productivity wages or ask your own question. If Trickle Down Economics Works, Then Shouldn't “Trickle Up” Economics Work as Well? Aside from buying IPOs, what exactly is the point of shareholders? Link between Productivity and Labour Force? When does a high markup mean high productivity? Never?